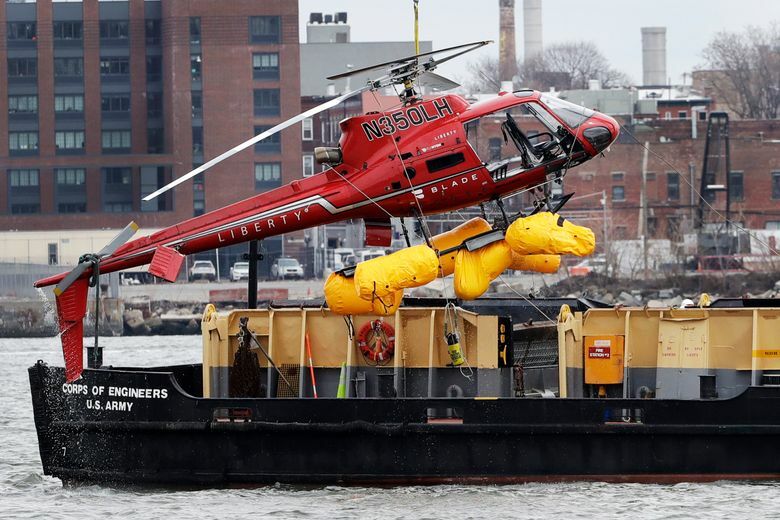 NEW YORK (AP) — Investigators recovered a flight data recorder and a GoPro camera Tuesday as they tried to determine the cause of a deadly helicopter crash in the East River and figure out whether passengers’ harnesses hindered their escape from the sinking aircraft. The helicopter’s five passengers drowned when it touched down in the river and capsized, medical examiners said. The pilot escaped. National Transportation Safety Board investigators picked over the damaged helicopter at a police hangar as one victim’s family sued chopper owner Liberty Helicopters and others. The lawsuit spotlights the harnesses used in the open-door flight and notes the aircraft’s inflatable floats didn’t keep it from flipping over and sinking. The way passengers were harnessed, with a release mechanism in the back, there “was just no prospect of safely escaping,” said Gary C. Robb, a lawyer for the parents of 26-year-old Trevor Cadigan. “Hanging upside-down in frigid water — stunned by the helicopter crash, tightly harnessed, release inaccessible, with no advanced training — is a death trap,” said Robb, based in Kansas City, Missouri. The lawsuit seeks unspecified damages, but Robb said Cadigan’s parents mainly want to end open-door flights for taking aerial photos. Liberty Helicopters hasn’t responded to requests for comment and referred all inquiries to federal authorities. The NTSB said the aircraft had been flying about 2,000 feet (609 meters) over New York on a scheduled 30-minute flight when the pilot sent out a mayday call saying his engine had failed. After the helicopter made a hard landing in the water, it tipped over and was carried upside-down in the fast river current while police and fire department divers tried to free the passengers from their safety harnesses. Two victims died in the water. Three more were pronounced dead after several hours of treatment at a hospital. NTSB investigators said electronic devices recovered from the helicopter or from the victims, including the GoPro camera and data recorder, were being sent to laboratories in Washington. Officials also were examining the restraint systems. Passengers’ safety harnesses on open-door photo tours are different from pilots’ seat belts, said helicopter pilot Bill Richards, of the aerial photography company New York Film Flyers. Harnesses made to keep overzealous passengers from falling out of an aircraft’s open door, he said, are much harder to unstrap. Passengers get a knife they can use to cut themselves free, but that doesn’t mean the passengers know how to use them. New York-based aviation attorney Brian Alexander said the harnesses themselves “may not be a problem,” but it might be crucial to know how thoroughly passengers are briefed about getting out in an emergency. “If you’re a tourist off the street, and it’s the first time, that’s where it seems to me it triggers a much higher duty for these operators to make sure the passengers are prepared to handle that,” he said. Besides Cadigan, the others who died in Sunday’s crash include a Texas firefighter, an Argentine tourist, a former basketball team assistant and a 34-year-old man. Liberty has been involved in at least five accidents or other incidents in the last 10 years, according to Federal Aviation Administration data. Three incidents ended in safe landings after, for example, one chopper clipped another while taking off from a helipad. But an August 2009 collision over the Hudson River between a Liberty chopper and a small private plane killed nine people. Democratic U.S. Sen. Chuck Schumer has called on the FAA to suspend Liberty Helicopters flights until the facts of the crash are known. Democratic U.S. Reps. Carolyn Maloney, Jerrold Nadler and Nydia Velazquez renewed calls for banning sightseeing copter flights over Manhattan and Brooklyn. Some Democratic New York city council members are pressing the city to take its own steps to crack down on helicopter tours, though it’s unclear how much the city can do. The tony town of East Hampton tried to limit flights to its airport, in the name of limiting noise, but charter helicopter companies and other aviation groups sued successfully to block the rules. A federal appeals court said the town didn’t have the authority to impose them without FAA approval. 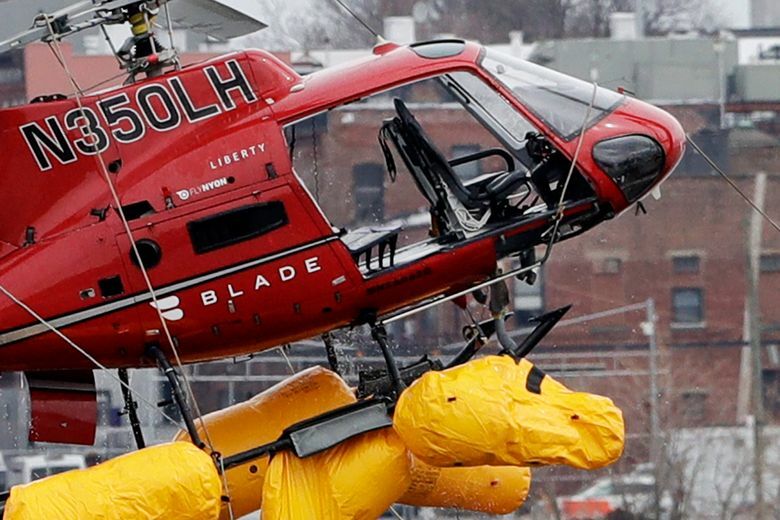 Still, New York did work with the FAA and helicopter companies to eliminate tour flights over land earlier this decade, and the city struck a 2016 deal with chopper operators to halve tour flights from a city-run Manhattan heliport and stop those flights on Sundays. The helicopter in Sunday’s crash, however, took off from Kearny, New Jersey, according to FlightRadar24, a flight-tracking website. This story has been corrected to show the helicopter took off from Kearny, not Kearney.